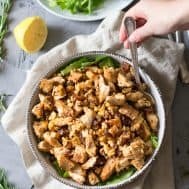 An easy and healthy, savory and sweet Paleo chicken salad with dates and toasted walnuts that’s also Whole30 friendly. This is a great recipe for leftover roasted turkey or chicken and is perfect for the holiday season or anytime! Gluten free, dairy free, refined sugar free. It’s official – I have finally pulled away from my enmeshed relationship with pecans and tried out another nut. Change is hard sometimes, don’t you think? I definitely won’t be breaking up with chicken salad anytime soon though, that’s for sure. Chicken is just way too fun to make fancy, and, I swear, it literally goes with everything. What other meat can you pair with fruit and nuts so well, then eat cold and it actually tastes good? I guess sausage might be an option? Except for the cold part. I thought sausage would always be an option for me, but, maybe I’m wrong. Maybe chicken is really where my heart’s desire lies. Can’t I have both? Yes, yes, I think so – and you can too. 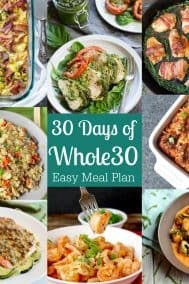 But let’s focus on the chicken today since that’s exactly what my recipe involves – an easy, make ahead or make-for-right-now recipe that’s both Paleo and Whole30 friendly, and so easy that even Adam can manage it. And seriously guys, he has trouble with boxed mac n cheese so this is saying quite a lot. 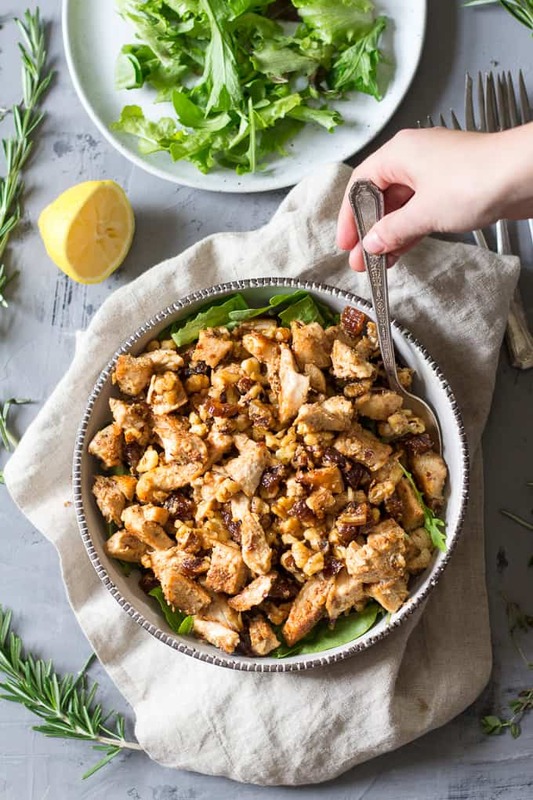 This chicken salad get EVEN EASIER if you happen to already have leftover cooked chicken or turkey lying around the house (in the fridge, of course) just waiting to be given new life. Super dramatic, I know, but re-purposing leftovers is serious business over here! 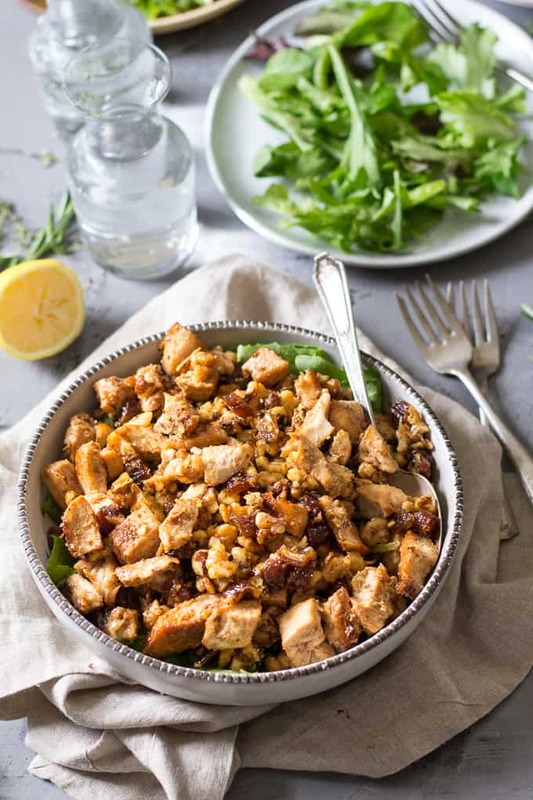 In addition to the cooked chicken, you’ll need some chopped walnuts and cinnamon, pitted dates, Paleo mayo and fresh lemon juice. I used my recipe for easy homemade Paleo mayo which I highly recommend, or you can purchase this amazing Avocado Oil Paleo Mayo to make things super easy! As much as I love my own mayo, I have to say the Primal Kitchen brand is seriously tasty. 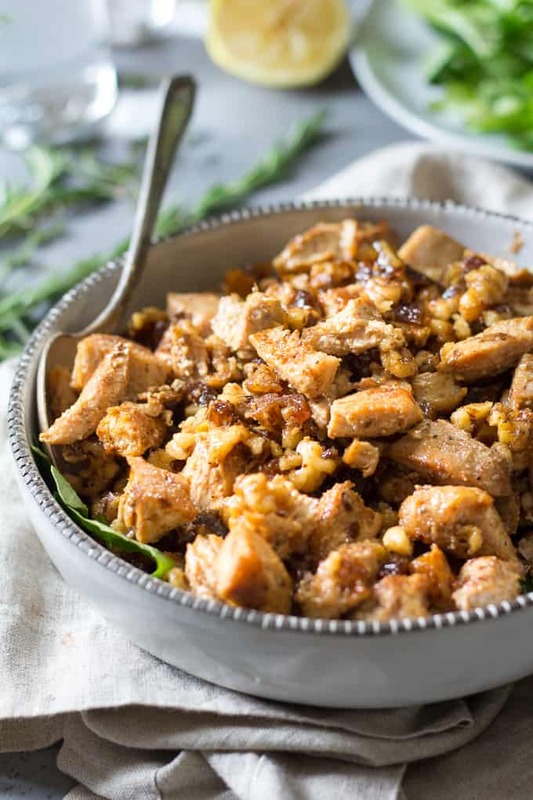 Once you have your chicken cooked and chopped, walnuts toasted with cinnamon and dates chopped, all you have to do is mix, squeeze (the lemon!) and EAT! I highly recommend some sort of greens – either a lettuce wrap or over a simple green salad. 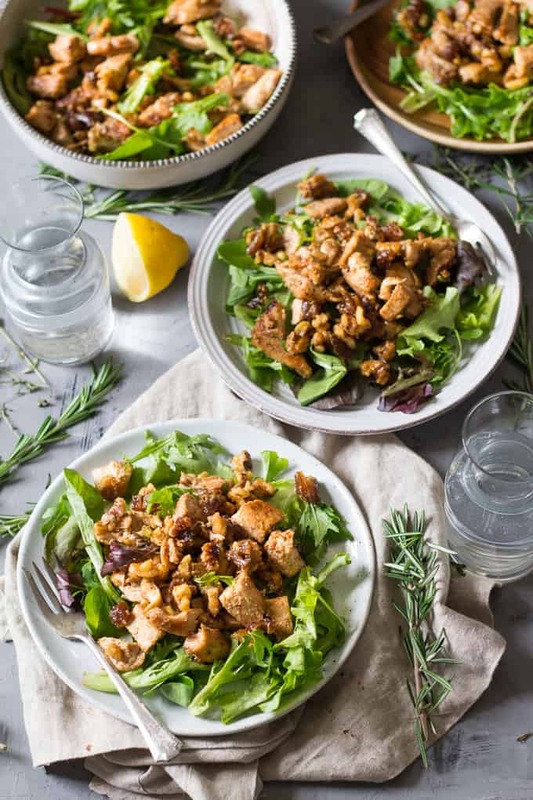 You can also eat this chicken salad all on its own since it’s so packed with flavor and very satisfying. Let me know what you think! 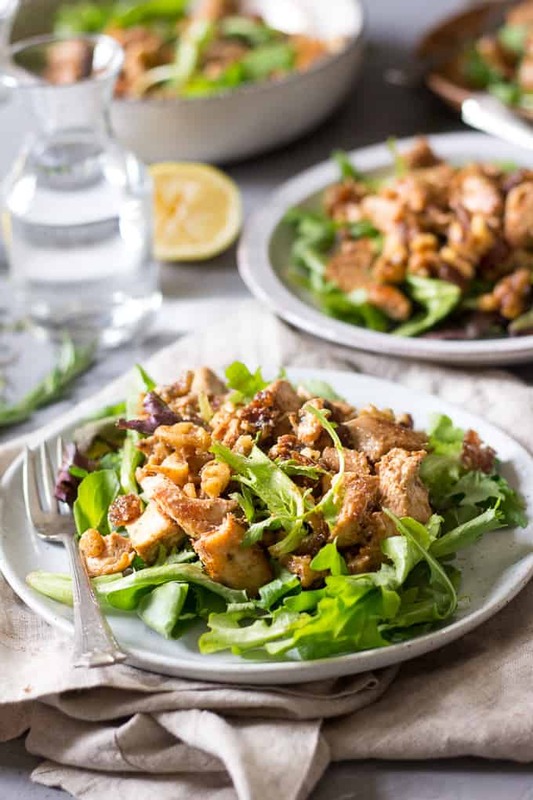 A savory, sweet and healthy Paleo chicken salad with pecans and dates, Paleo mayo and fresh lemon that's perfect for lunch or dinner, and great for the holiday season or anytime! You can cook the chicken ahead of time and it's also perfect for leftover roasted chicken or turkey. Season your uncooked chicken with salt, pepper, onion powder, and poultry seasoning. Add to the pan and sauté, allowing each side to cook about 3 minutes, until the outside is golden brown and the inside is no longer pink. Remove from heat and set aside to cool. Meanwhile, you will toast the walnuts. Heat your oven to 300 F and in a small bowl, toss your walnuts with the cinnamon, then spread out on a parchment paper lined baking sheet in a single layer. Roast in the preheated oven about 10 minutes or until lightly toasted, remove from oven and set aside. 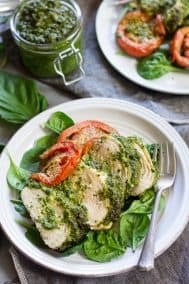 Once your chicken has cooled to room temperature, chop it into bite sized pieces (or shred) and add it to a large bowl. Then add the toasted walnuts, chopped dates, Paleo mayo, and lemon juice. Toss everything together to coat and serve right away over greens. Store leftovers covered in the refrigerator for up to 4 days. Enjoy! 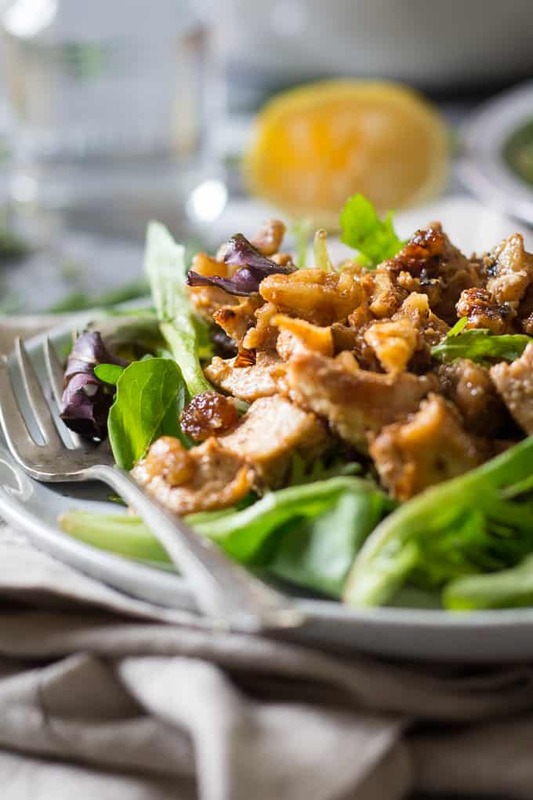 Want more Paleo Chicken Salad Recipes? Try one of these! What have you been lunching on lately? What nut will you never break up with? My lunches have been boring- salads with grilled chicken or leftovers. This would be a great way to change things up! I always love new ways of making old standards! This is the most perfect chicken salad! 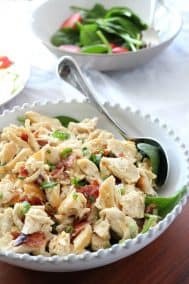 I’m always looking for ways to spice up my chicken salad, this looks like a winner winner! I LOVE chicken salad, and this sounds/looks absolutely wonderful. I only made paleo mayo once, but it would be fun to try your version. I’ve used the same recipe for so long, it’s awesome! Delicious. I added some diced celery. Great crunch and compliments recipe well!